For better or worse, we’ve all come to grips with the fact that life isn’t always a smooth ride. Turbulence along the way is inevitable and in these rough patches, we’re forced to find our own way. Sometimes, things just aren’t worth the trouble. Sometimes, we decide to quit and move on. And thus, we put on our war paint and we march through the battlefield. 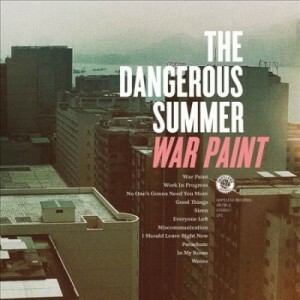 The Dangerous Summer are no strangers to the ups and downs of life. Between the release of 2009’s Reach For The Sun and War Paint, they’ve had their fair share of struggle: the temporary departure of drummer Tyler Minsberg (who does not play on the album), the feud between guitarist Cody Payne and the now broken-up You, Me, and Everyone We Know, coping with their careers as musicians, and more. But instead of whining on their new record, the Maryland four-piece has crafted a timeless anthem of growth, struggle, and determination, all without appearing trite. Title track “War Paint” opens the album with a rapid blare of drums and guitars, eventually easing off for vocalist AJ Perdomo to make his entrance. Right away, Perdomo’s honesty and emotional delivery shine through, belting out “There’s a lot on my plate / And the ones I loved stopped answering / They left me to find my self / In my own hate.” Second track “Work In Progress” continues with even more intensity, providing an emotionally moving self-examination that rides out on a wave of reverb and deep panting. Musically, War Paintis the most varied that the band has ever been – one of the only flaws of their debut – a sentiment that is highlighted by the sharp transition from the dark “Work In Progress” to the relatively chipper sounding “No One’s Gonna Need You More”. Ironically, the song’s subject matter is nowhere near as happy as it sounds (“Moving ‘cross the country / I lost track of time / Trying to make a name for myself / ‘Cause every lonely heart / Can use an honest song / They can sing along to.”) but the change in sound does provide a breath of fresh air. The highly optimistic “Good Things” and lively “Siren” continue with the atmospheric blend of drums and guitars, with a greater emphasis placed on Bryan Czap’s undulating lead guitar line on the latter. Standout track “Everyone Left” slows things down, while also demonstrating just how much the band’s songwriting ability has improved, especially the lyrics of AJ Perdomo. While Perdomo has always been inclined to wear his heart on his sleeve, his visceral lyrics have begun to take a more poetic and abstract turn, painting an even more powerful image of his emotional and mental state. On “Everything Left” he questions, “When you decided to take it / What did you take from it? / Was it worth the heart involved? / The obstacles? / The chemicals? / I need to know what you’re trying to see.” and we wonder ourselves. That’s the beauty of War Paint. It’s an album that we don’t just passively enjoy, but one that we can all actively relate to; one that reminds us that no matter what life is throwing at us, we can put on our war paint and fight our way through. Hopeless Records have released a brand new music video to “War Paint”, the opening track from The Dangerous Summer‘s forthcoming album War Paint. The fantastic album is set to be released on July 19. You can preorder from Hopeless Records here. The Dangerous Summer will release their new album War Paint on July 19th via Hopeless Records. War Paint is the band’s highly anticipated follow-up to 2009’s Reach For The Sun, also released via Hopeless Records. The album artwork is shown above and the tracklisting is below. Below, you can watch AJ Perdomo and Cody Payne perform “No One’s Gonna Need You More” acoustically for Ourzone Magazine. The band has reportedly been playing this song live at their recent shows and will be releasing videos for both “No One’s Gonna Need You More” and “Work In Progress”. Platinum selling indie-pop band Hellogoodbye has announced a tour to support their album, Would It Kill You?, which was released last winter. They will kick off the tour with a run of shows before this summer’s Warped Tour. Hellogoodbye will begin this weekend in the UK playing with bands Gold Motel and The Dangerous Summer. After the UK they will play a couple shows with Mansions, Therapies Son, TS & The Past Haunts, and more. There main post-Warped Tour US tour will be played with Fences, Fake Problems, and A Great Big Pile of Leaves. Read more to see the tour dates. 6/19 San Diego, CA @ SOMA ! # = w/ Black Heart Procession, Ha Ha Tonka and more. Chris Cleary and Bobby DiBari, the duo behind eletropop band Hailey, It Happens, performed their single “Brighter” acoustically in our newest Lost In The Sound Session. Their album Aurora (read our review here) was released independently on April 5, 2011 and was mixed by Paul Levitt (The Dangerous Summer, All Time Low). You can stream the entire album over at the band’s Purevolume page. If you enjoyed this session, be sure to check out their Facebook, Myspace, and Twitter pages. Aurora is available for purchase via Bigcartel or iTunes, and will be pressed onto vinyl via Collective Confusion Records. On March 15, The Dangerous Summer played a show The Studio at Webster Hall in New York, premiering a brand new song called “Everyone Left” and playing a cover of Bush‘s “Glycerine”. “Everyone Left” will be included on the band’s forthcoming album, set to be released later this year, and is the same song that was demoed on the band’s Tumblr back in October. You can now preorder The Dangerous Summer‘s An Acoustic Performance of “Reach for the Sun” on iTunes. The album will be released on March 15, in digital format only. The band also just announced dates for their headlining tour with Sparks The Rescue, The Graduate, and The Scenic. Dates and ticket information are available here. The Dangerous Summer have announced a spring tour with Sparks the Rescue, The Graduate, and The Scenic throughout the months of March and April. Dates are in the replies.